NTT Broadband Platform, an NTT Docomo subsidiary operating public wi-fi services, recently announced the launch of its complimentary wi-fi service for iOS, intended to serve international travelers to Japan. 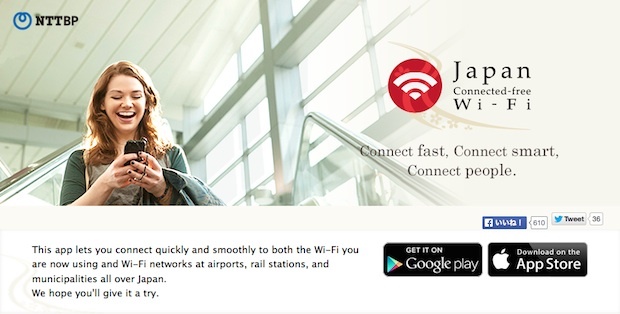 This service is called ‘Japan Connected-free Wi-Fi’ and was initially launched for Android users back in November. All you need to do is to install the app on your smartphone and sign up when you launch the app for the first time. It lists over 16,000 free wi-fi hotspots nationwide in Japan, including 7-Eleven stores, Denny’s restaurants, JR railway stations, and many other public places. Unfortunately when you’re offline, you can’t use the map to find the nearest location from where you are. But the app shows you several signs that designated internet accessible areas which you can probably find around town, so it will be relatively easy to get a connection. The service is available in English, Chinese (simplified and traditional), Korean, and Japanese. On a somewhat related note, our readers may recall the Tokyo Bureau of Transportation also started in-train and in-bus complimentary wi-fi service aboard their bus and subways, specifically intended for serving international travelers.